BBQ squid with ginger sauce. 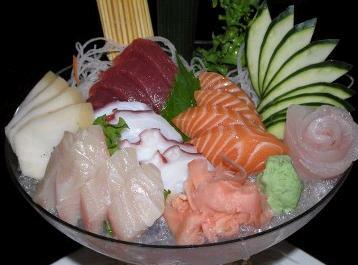 Assorted seafood with Ponzu sauce. Fried rice or noodle of choice with chicken. Fried rice or noodle of choice with beef. Fried rice or noodle of choice with shrimp. Fried rice or noodle of choice with salmon. Fried rice or noodle of choice with vegetable. Steak, chicken, salmon, shrimp, tempura, sushi or sashimi. Crabmeat, avocado & fish egg. Egg omelet, crab & pickled vegetable. Sauteed chicken & vegetable with noodle of choice. Sauteed shrimp & vegetable with noodle of choice. Tempura shrimp, chicken, egg & vegetable broth with noodle of choice. Thinly sliced beef, clear noodle & vegetable in stew style. Assorted raw fish over rice. 3 rolls - Avocado, Sweet Potato & Budda's. 3 rolls - Cucumber, Avocado & Spinach. 3 rolls - Tuna, Yellowtail & California. 3 rolls - Tuna, Yellowtail, Shrimp Tempura. 6 pcs Sushi, 4 pcs Sashimi & 1 Tuna Roll. 6 pcs Sushi, 4 pcs Sashimi & 1 Salmon Roll. Chef's choice of 18 pcs. Chef's choice - 5 pcs Sushi, 10 pcs Sashimi, 1 California Roll. Eel Dragon Roll, California Roll, Rainbow Roll, 10 pcs of Sushi. Eel Dragon Roll, California Roll, Rainbow Roll, Banihana Roll, Sakura Roll, Tuna Roll. Eel Dragon Roll, California Roll, Rainbow Roll, Kamikaze Roll, Tuna Roll, Yellowtail Roll, 15 pcs of Sushi. White rice with broiled eel on top. White rice with thinly sliced tuna on top. Served with Miso Soup, green salad, white rice.